UK customers: prices include VAT and FREE UK mainland delivery (some exceptions, please see below*). We are often asked about the difference in pricing between the US and the UK. There is always big difference between US and UK prices because the US prices do not include any of the things we have to pay for in Europe, like import duties and VAT etc, plus the cost of bringing the products over from the US. It is always difficult for people to understand the huge extra costs that importing to the EU involves. It is frustrating! Shipping is hugely more expensive here too. Also, please note that the US products are 110V and they are not safe or legal for use at 240V in the UK/EU because they do not conform to the EU safety requirements. We have to change some of the parts to make them safe and legal so our products are adapted for the UK and EU - they are 240V, fully CE approved and EU legal, conforming to all EU safety requirements. *UK Offshore destinations - additional charges may apply. This includes Isle of Wight, Isle of Man, Isles of Scilly, Channel Islands, Northern Ireland, Highlands and some areas of Scotland. If you are located in any of the following postcodes, then please select Highlands - AB30-38, AB44-56, FK17-99, G83, IV1-28, IV30-39, IV52-54, IV63, KW1-14, PA21-23, PA34-40, PH18-26, PH30-41, PH49-50. Overseas Shipping costs are extra: To find out the shipping cost for overseas add the items you require to the Shopping Basket, select your location when requested and shipping costs will be displayed. You can check out shipping costs this way without any obligation to purchase. 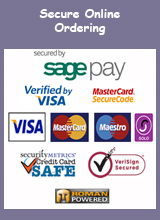 We aim to ship your order as quickly as we can but please allow up to 7 to 10 days for delivery. Overseas Shipping times vary depending on size of order and destination,. We use Interlink Express Courier, DPD, FedEx or UPS depending upon destination. Overseas shipping is by the most cost effective method available, giving the fastest traceable service available at reasonable cost. This is not always a location trackable service. If you require a location trackable service, please ask for a separate quotation.